Monsters, Inc. Mike And Sully To The Rescue! Lately Theo has decided that there are “happy monsters” in the world. I don’t know if this is his way of dealing with his subconscious fears or what, but if ever there were happy monsters, you can find them in Monstropolis. So it’s with this in mind that he and I headed to Monsters, Inc. Mike and Sully to the Rescue! 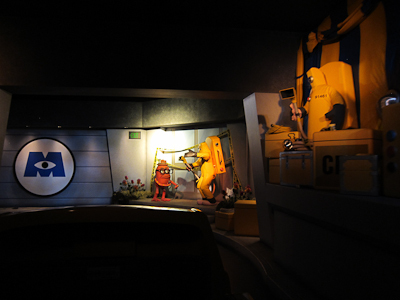 Yeah, I took this during ElecTRONica so it's not a very good representation of what Monsters, Inc. actually looks like. It’s over there on the right. 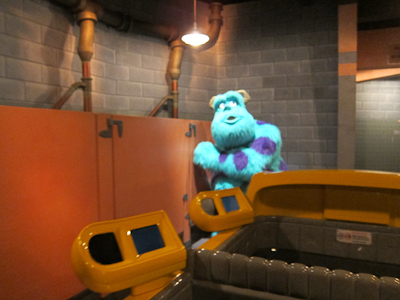 Monsters, Inc. replaced one of the Mouse-Next-Door’s strangest opening rides, the Superstar Limo. I won’t go on about Superstar Limo except to say that it was truly strange and you should go look it up on Youtube if you never experienced it for yourself. 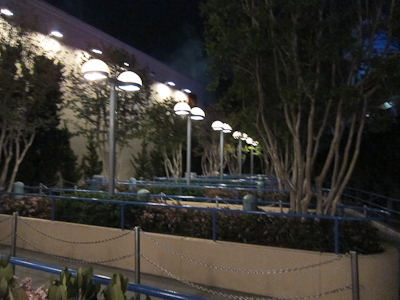 Anyway, Monsters, Inc. is hidden back in the Hollywood Backlot area, which I think is a wonderful little part of the park that gets easily overlooked. 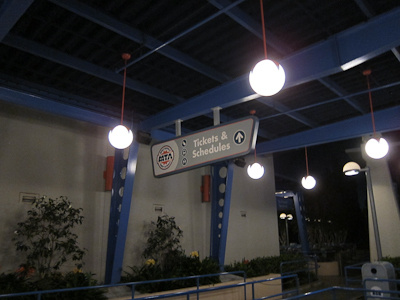 You’re about to take a taxi through Monstropolis, so be sure to follow the signs for tickets and departures. 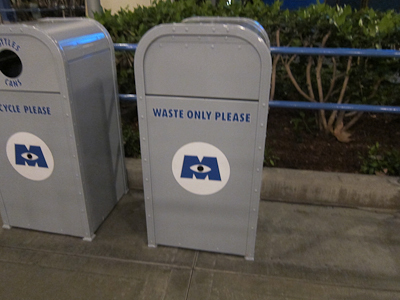 I totally love the Monstropolis theming, including the adorable logo. Keep your eye out for human children! Here comes one now! The queue was designed to hold a number of people but when we went it was a walk-on. This would be a nice place to wait, though. 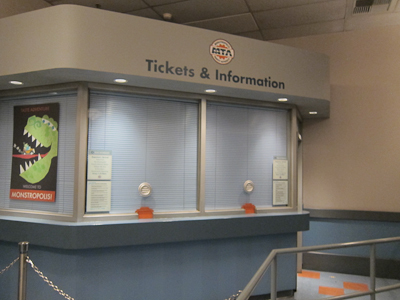 Inside the building, mysteriously, the ticket window is closed. Was it something I said? 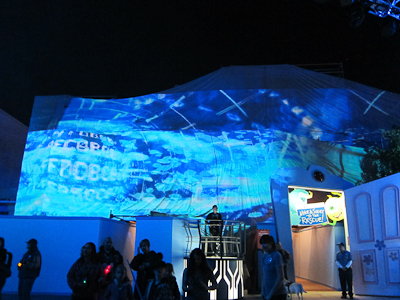 There are tons of great visuals while you wait. 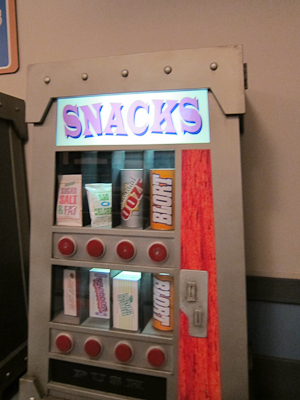 I particularly liked the vending machine. "Sugar, Salt & Fat"? Now THERE'S truth in advertising! I’m going to wash that down with a Blort. Actually I’m just going to say the word Blort. It’s funny. You try. Fully refreshed, we approached our taxi. The cast member suggested my “little monster” might have the best view from the back seat, so we climbed in and sat down. On the left of the taxi was a little screen. I AM AN AWESOME PHOTOGRAPHER!!! Boo was on the loose! It was monster chaos! And that’s the worst kind of chaos! And what am I doing in this taxi? There's nothing like taking pictures from a moving vehicle. "Look, Mommy! Monster have Band-Aid!" 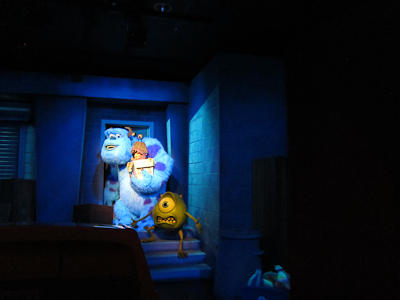 And then we saw those sneaky monsters–our heroes Sully and Mike, and the barely disguised Boo. Theo called Boo the "Baby crab." Which I guess she kind of looks like in a sort of crab-like monster costume. You’re treated to various scenes from the movie, including this one, which is particularly relevant since my little monster does this a lot. "Mommy! She's singing on potty!" My favorite room is the door room. 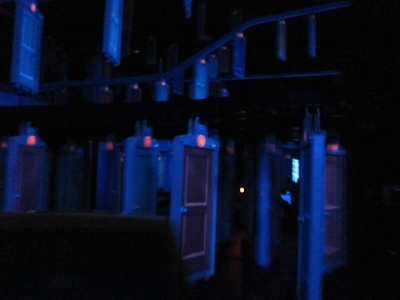 You enter the big dark room and there’s all kinds of doors and reflections of doors swinging around. The optical illusion is fabulous here. I'll take door number 3! 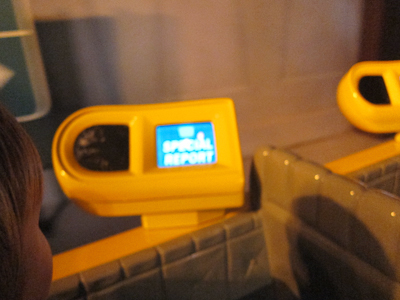 Once the crisis is averted, you and your taxi are decontaminated for your trip back to, well, not Monstropolis. 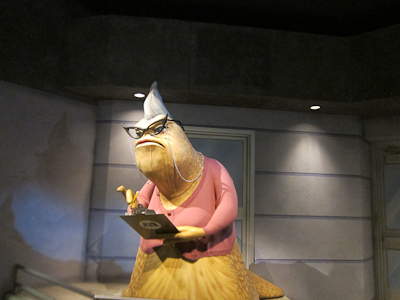 Oh, and this is Roz. Talk to her and see what happens! 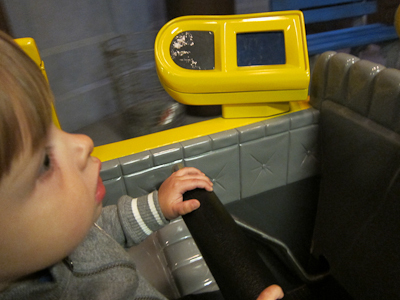 Theo LOVED this ride. 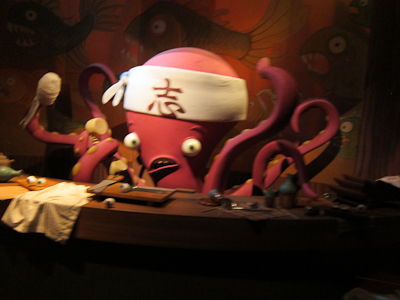 In fact, as soon as we got off he asked to go on it again, but we were right at closing so we weren’t able to. 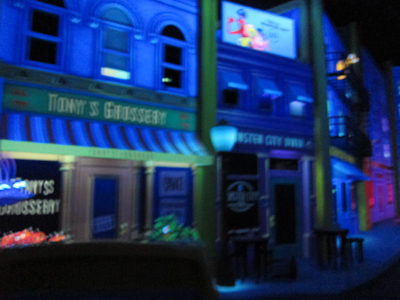 This is a fantastic dark ride for the adults and the kids, even if you haven’t seen the movie. Tell your friends about this awesome post! Oooh, thanks for highlighting this. 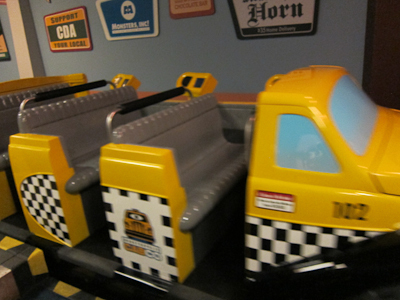 I have never seen this ride. I bet my 2 year old would groove on it too. I just invested in a season pass (thanks in part to your website) and hope to be out there the first Sunday the Spring Break block is lifted for Socal season passholders! Will check this one out with the boy! Get MYWTM delivered to your inbox!